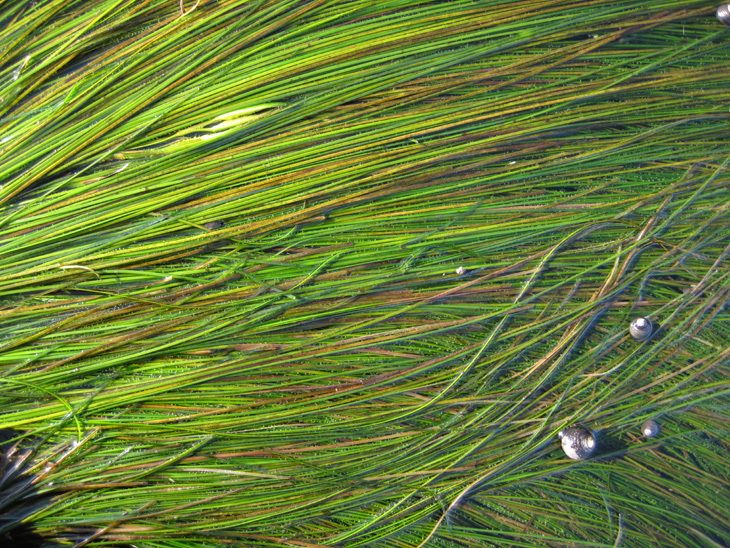 Surfgrass is an angiosperm with true leaves, stems, and rootstocks; not an alga. P. scouleri leaf blades are characteristically flat and wide (2-4 mm) reaching no longer than 3 feet in length. Leaves arise from a congested rhizotomous base and flowers are found near the base on short stalks (1-6 cm). P. torreyi leaves are characteristically less than 2 mm wide and are generally more firm, cylindrical, and wiry than P. scouleri. Leaf blades can reach up to 10ft long. The leaves arise from a congested rhizotomous base with flowers on elongate stalks (>10 cm long). (Adams 2006). P. scouleri can be found at or below zero tide level or in mid-low tide pools from Sitka, Alaska, to Baja California (O’Clair and Lindstrom 2000). Mostly found on rocks without sand inundation. (Kozloff 1996). P. torreyi can be found at or below zero tide level or in mid-low tide pools from Vancouver Island California to Baja California (Phillips and Ernani 1988). P. torreyi is more likely to be found in sand-scoured areas than is P. scouleri (Kozloff 1996). Surf grasses grow as perennials and adult plants are reproductively dioecious with male and female flowers on different adult plants. Surf grasses can pollinate both underwater and at the surface in sea water. Surfgrass ranks amongst the most productive of the marine primary producers (Duarte and Chiscano 1999), with these habitats providing shelter for many invertebrates and supporting many species of algae (Stewart and Myers 1980). The red algae Smithora naiadum and Melobesia mediocris are exclusively epiphytic on sea grasses (Abbott and Hollenberg 1976). Surfgrass also provides nursery habitat for fishes and invertebrates, some of which are commercially important, such as the California spiny lobster (Engle 1979). Surfgrass beds increase water clarity by filtering water and trapping sediments and can stabilize the sediment, preventing erosion. Seagrass metabolism changes the concentration of carbon and oxygen in water by sequestering carbon dioxide and respiring oxygen. Surfgrass forests can modify the severity of water currents, making near shore habitats relatively protected from big surf. The structure of surfgrass canopies modifies water current velocity and waves, enhancing sedimentation of suspended particles and preventing sediment resuspension (Garcia and Duarte 2001). Phyllospadix is susceptible to desiccation and heat stress during low midday tides (Raimondi et al. 1999). It is also sensitive to sewage (Littler and Murray 1975) and oiling (Foster et al. 1988). If the rhizome systems remain viable, recovery following disturbance can be fairly rapid; however, if the entire bed is lost recovery is slow because recruitment is sporadic and restoration projects have thus far been unsuccessful (Turner 1983, 1985). Other threats to surfgrasses include coastal development, thermal pollution (power plants), invasion of non-natives (e.g. Caulerpa taxifolia), and dislodgement caused by anchors. 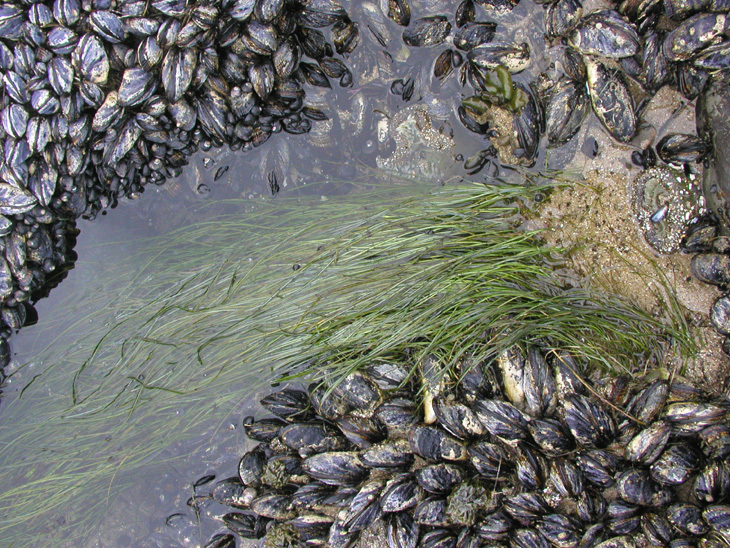 The sensitivity of seagrass habitats to declines in ecosystem health coupled with their fundamental role in sheltering countless other species (many of which have commercial value) has led to their protection at the United States federal level under Section 404 of the Clean Water Act as well as in Section 10 of the Rivers and Harbors Act. The Environmental Protection Agency holds the responsibility of enforcing these pieces of legislation which aim to protect these habitats from unpermitted dredging and filling activities (Green 2003).